The rich, buttery flesh of the avocado is one of nature’s most perfect foods. The nearly 20 vitamins and minerals in this luscious fruit include vitamins E and C, as well as beta carotene—powerful antioxidants that help repair free radical damage from sun exposure and environmental toxins. Even the fats and sugars in avocados are the kinds that are good for you! Early Spanish missionaries in Central America used avocados to treat wounds and improve the skin, a trick they most likely learned from the Aztecs, Mayans, and Incans who lived in the avocado’s native rainforest habitat. In fact, many stories claim that the Indians’ ancient ancestors were the first to use the avocado as a cosmetic. Like so many herbalists and healers before the dawn of modern science, these ancient researchers undoubtedly relied and their on keen intuition and powers of observation to make a logical deduction: External application of a succulent, creamy food that nourished the body from the inside would also feed and enhance their skin and hair. Now 21st century science is showing why and how this nutritional treasure lives up to its legendary reputation. In addition to repairing cell damage, avocados help revitalize our skin in several other ways. Research suggests that the D-manno-heptulose sugars in avocado help prevent infection by forming an antimicrobial shield on the skin surface. Even more important, these complex natural sugars appear to increase the strength and resilience of the skin’s underlying collagen network. Avocado oil is also a superior softener and moisturizer. In fact, this natural emollient outperforms every synthetic moisturizer on the market. Petroleum-based moisturizers, for instance, sit on the surface and slow cell turnover—exactly what you don’t want! The avocado’s plant-based lipids, essential fatty acids, and sterolins, on the other hand, do all the right things: These rich, yet non-greasy, oils penetrate the skin, lock in moisture, and deliver vital nutrients that accelerate cell regeneration. All these healing and restorative properties help support and explain avocado oil’s effectiveness as a treatment for eczema and psoriasis. 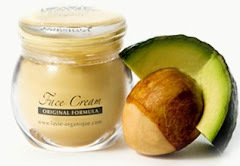 The all-natural avocado oil in Lavie-Organique™ Face Cream and Day Cream is elegant food for your for your skin. Like all the ingredients in the Lavinia Borcau personal care system, this plant-derived oil is a simple, powerful, and luxurious way to nurture healthy, beautiful skin.